Imperator Furiosa (Charlieze Theron) is on a mission; to get a group of women being used as breeders away from the evil control of Immortan Joe (Hugh Keays-Byrne). Taking a tanker for refueling across the stark desert from the compound run by Immortan Joe is the perfect chance, and she gets a hell of a way before he is on her tail – with his crew of followers, including the War Boys – men who are ill with some kind of perhaps radiation poisoning and live to give their lives for Immortan Joe. Nux (Nicholas Hoult) is one of these, and Max (Tom Hardy), who has been captured, is being used as his ‘blood bag’ – his blood is being transfused from him. Max gets free and ends up reluctantly helping/being dragged along for the ride with Furiosa. It’s awesome. It most certainly fills all my love for explosions and chases and all of that. Plus, it has a kick-arse female character – actually, it has quite a lot of kick-arse female characters. 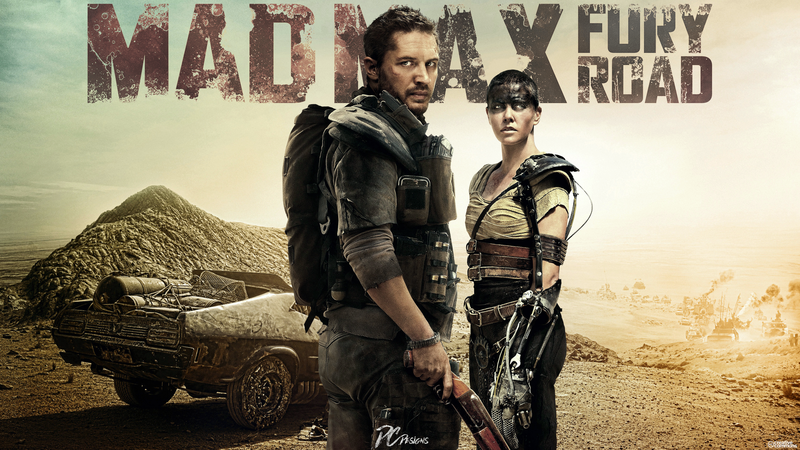 Max is almost an after thought in the film, it is so much the journey of Furiosa. However, Hardy is perfect as Max – he has the humour and toughness that Mel Gibson had back in his heyday – and there is very much the feel of a man beyond desperation. I think the breeders possibly could have been a bit more clothed, though I understand the arguments for their near-naked state. Charlize Theron has shown again and again how amazing she can be, and here a lengthy close up on just her eyes can tell you so, so much. It’s so refreshing to have a woman being strong without a man puppet mastering her from afar. More kick arse women like this, please. We all love them. Oh, and the guy on a bunji cord playing a guitar that shoots fire? Yeah, him too.